Interviews with people and families involved in the industry have provided fascinating and valuable information about the companies, working lives, about how the sand was extracted and about the machinery and processes involved. A clear line of development is shown, from the early days of back-breaking shovelling done by the sand ‘dobbers’ and the use of horse-drawn carts to remove the sand, to the introduction of mechanical excavators, screening and washing equipment and the arrival of the light railway. Mechanised means of loading the sand into wagons were introduced, after which it would be transferred to the main railway line for onward transport to all parts of the country and abroad. Sophisticated industrial equipment is now used and sand is moved by road. 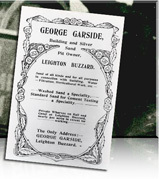 Well known company names in Leighton Buzzard and Heath and Reach can be recognised and have been documented in these pages. 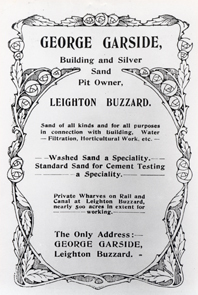 Garside has been a familiar name offering employment in the sand industry around the Leighton Buzzard area for several generations. 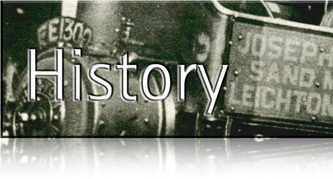 Arnold was also destined to become a well known name in the local sand industry following the establishment of a business formed by John Arnold in the 1860’s. 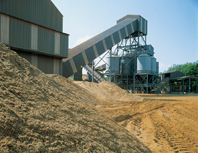 The Jones’ family quarried sand after World War two and had three operational pits in the later 1960’s and LB Silica Sand Ltd is still trading locally. We are grateful for all the information and assistance provided with these pages.